Cotterpin Consulting | “Please, sir, may I have some more?” Quaker Oats oatmeal, from farm to fork. “Please, sir, may I have some more?” Quaker Oats oatmeal, from farm to fork. 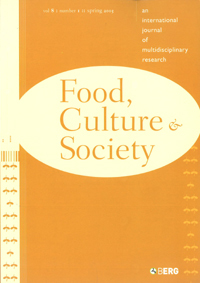 I became interested in the intersection of food and culture while still an undergraduate and, in the years after graduating, published this “farm-to-fork” commodity-chain analysis of the Quaker Oats brand in the peer-reviewed academic journal Food, Culture & Society, an unusual undertaking for a non-academic. The paper looks at the Quaker Oats brand’s cultural significance, marketing history, and place in consumers’ imaginations. Research sources included media coverage, interviews with government officials, corporate annual reports, company marketing materials, videos of archived commercials from past decades, and a 40-year-old issue of Business Week magazine that solved an otherwise seemingly intractable historical puzzle. In addition to showing my ability to gain my footing in a subject I was previously unfamiliar with, this paper is a good example of the strong voice and style I can bring to a project that does not require a dryly objective tone. Available online.